Click one of the hyper-links listed in the table of POWER's homepage (see below picture) to start a analysis pathway. POWER offers four analysis pathways. They contain five steps as showed by the pipeline comic in below picture. After going through a pathway, users complete an analysis. As users complete a step of an analysis, the circle represents that step in the pipeline comic will be filled to remind users what they have done. These pathways are different in two ways. One is in both of data types (DNA or protein) and data formats (sequences in FASTA format or aligned sequences in PHYLIP input format) of input data. The other difference is in the steps these pathways pass. 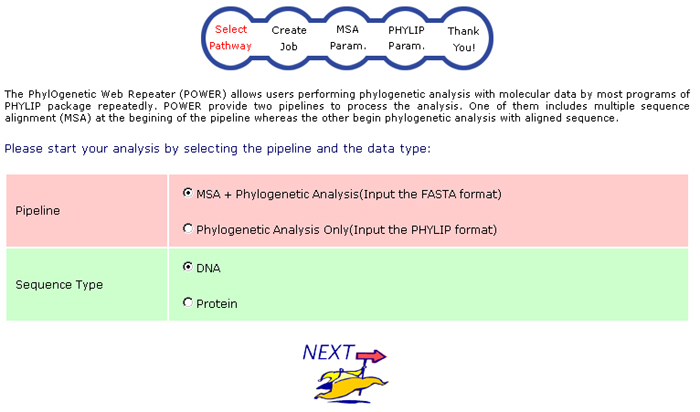 For example, if you click the hyper-link "DNA" of the item "Begin the analysis from MSA" (see below picture), means you would like to perform multiple sequence alignment (MSA) and phylogeny inference with POWER, and you should prepare the nucleic acid sequences in FASTA format as your input data. Or if you click the hyper-link "DNA" of the item "Begin the analysis with aligned sequence", means you prefer carrying out MSA by yourself, and you should use aligned sequences in PHYLIP input format as your input data. In pathways like this, the step of "MSA Param." on the pipeline comic is skipped. National Health Research Institutes. All rights reserved.